Inebriated man obviously has a penchant for stealing motors. 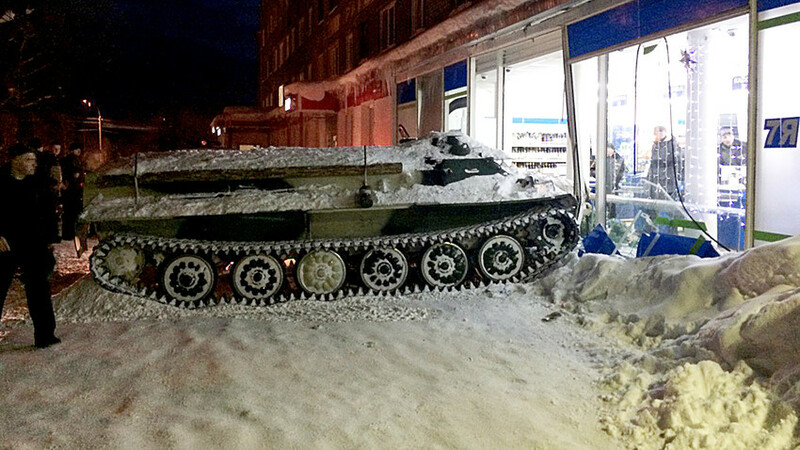 Early in the morning of Jan. 10 a half-cut resident of Apatity (a town 1700 km north of Moscow) stole an armored personnel carrier (APC) from a driving school’s parking lot before ramming it into a car and crashing into a shopfront. The rogue driver then hopped out of the vehicle and swiped a bottle of wine from the shop, but he didn’t get far - the police arrested him soon after. It turned out this wasn’t the first grand theft auto the culprit committed. He was caught jacking a KAMAZ truck just six days earlier and was awaiting trial, driving the authorities crazy. In Yekaterinburg, you can drive a tank without breaking any laws. Find out how.